With 110°, the Ethos-SX has 21% more AFOV area than the 100° Ethos design. This permits a nice 62% power increase from a 6mm Ethos, while retaining 68% of its TFOV. 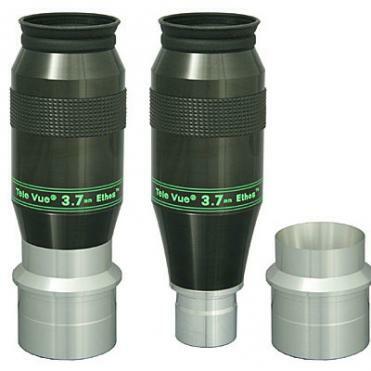 The 3.7mm actually has more TFOV than our 8mm Plossl, 6mm Radian, and 5mm Nagler Type-6! In 1.25" mode, it is parfocal with the wide range of 1.25" Tele Vue Plossls, Panoptics, Radians, Naglers, Nagler Zooms, and 6mm and 8mm Ethos eyepieces. The screw-on 2" adapter (included) is designed to make it parfocal with 13mm and 10mm Ethos when they are used in their 2" modes.